The administration, fearing that the program could remain frozen through the balance of Mr. Obama’s presidency, had asked the court to move quickly. On that point, at least, the court agreed, and it now appears that the case will be argued in April and decided by the end of June. This means that a decision will be handed down just as the primaries are ending and right before the national conventions. Things will get very interesting no matter what they decide. * Pew Research released this analysis today. 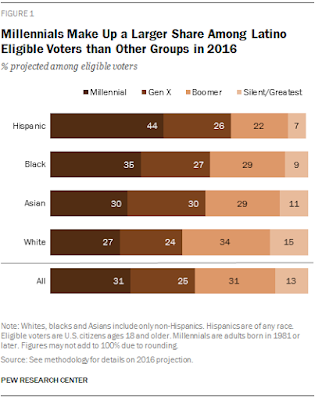 Hispanic millennials will account for nearly half (44%) of the record 27.3 million Hispanic eligible voters projected for 2016 – a share greater than any other racial or ethnic group of voters, according to a new Pew Research Center analysis of U.S. Census Bureau data. * Michael Brendan Dougherty says that a Pat Buchanan aid named Samuel Francis predicted the Trump campaign back in 1996. [S]ooner or later, as the globalist elites seek to drag the country into conflicts and global commitments, preside over the economic pastoralization of the United States, manage the delegitimization of our own culture, and the dispossession of our people, and disregard or diminish our national interests and national sovereignty, a nationalist reaction is almost inevitable and will probably assume populist form when it arrives. The sooner it comes, the better. * Civil rights icon Rep. John Lewis goes back a little further in our history to make a comparison. Mr. Lewis sees Mr. Trump as a modern-day version of George Wallace, the onetime Democrat and governor of Alabama who made his national reputation in the 1960s fighting integration. * Finally, here is an interesting conversation between Michele Norris and former Attorney General Eric Holder about our modern day civil rights challenges.